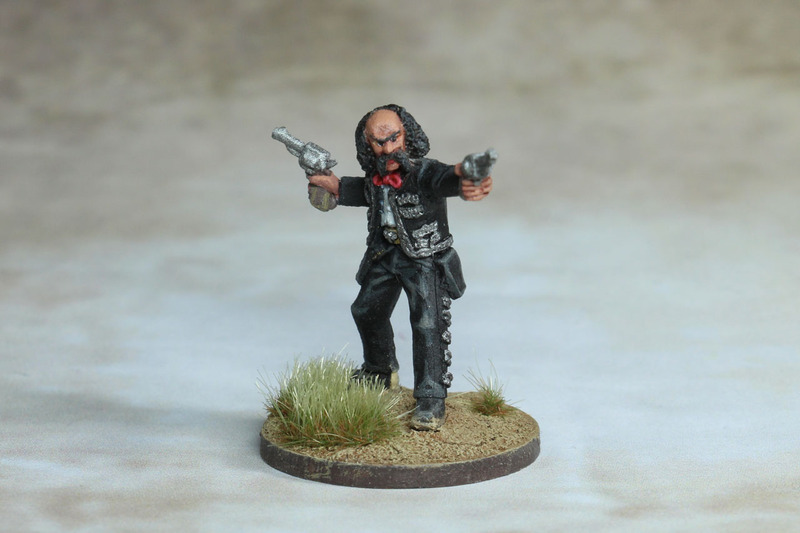 My third finished gang member for the Banditos is the planned leader of the gang. 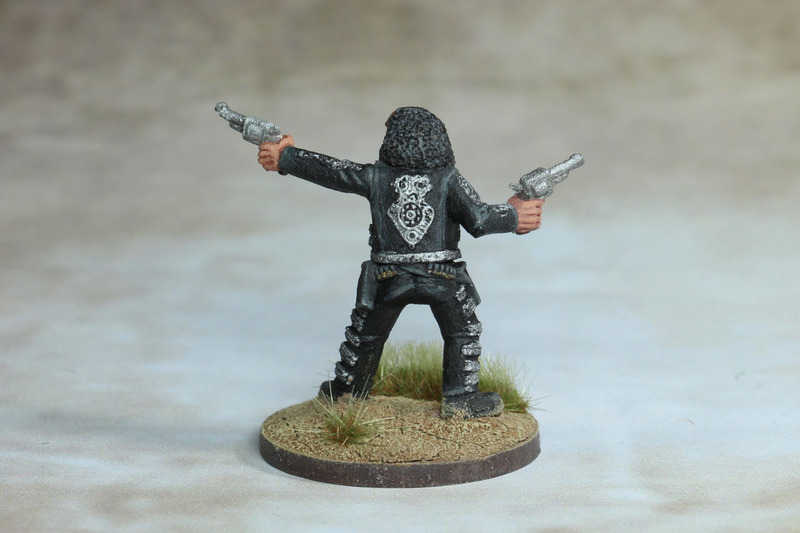 The dynamic pose and the aggressiveness the miniature expressed clearly called for that. The outfit was obviously inspired by Mariachibands and so I let myself be inspired by originals as well. Unfortunately, when I was looking for pictures, I quickly realized that the clothes weren’t far as colourful as I remembered them. Nevertheless, I decided to stay true to the look and tried to give the clean black of the suit a more worn out look, as if it had been worn for a continuously long time. I followed Citadel's app suggestion for "dirty black" again and was quite satisfied with the result. I wanted to keep the ornaments in silver, as this was the most common color in my search for pictures. That made painting a quick thing. In order to keep the silver from shining too much, I used a black wash over the base color, and only put some highlights onto the ornament details, such as the upper edges. Shoes, belts and holster I also kept in black, in order to keep the color choice somewhat unified on the mini. With black hair my washing technique, as described in the first article, did not work as desired. So that I used to paint with black and drybrushing with grey, which makes the curls look acceptable. All in all the mini seemed a bit boring that way, so I decided to paint the belt buckle and the cartridges in a bronze color and the scarf in red. Domingo Ortega watched as the sun raised from behind the dusty horizon. Soon he would show the citizens of Dead Man's Hand who was in charge. He remembered ... Mexico had just sold that part of the country to the United States. He was still a boy back then. A boy with a dream. 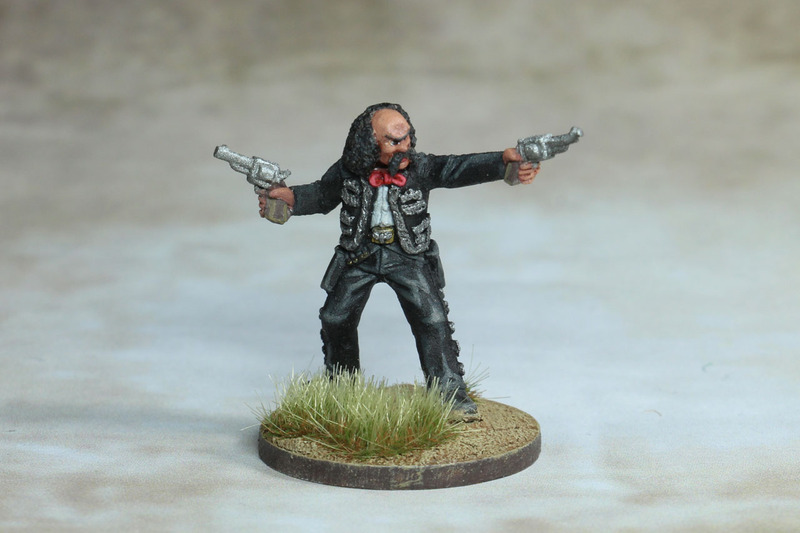 He wanted to become the best and most famous mariachi who had ever been seen. He was good on the guitar and his voice was concise and well-sounding. But the settlers had not appreciated his talent. How many times was he ridiculed or chased away when he demanded his payment!? And so only the suit of his dream remained. In recent years, however, he has had success in another business. Things had to be done that required rougher methods, and he had gathered numerous goons around him. He now had a new dream - one of an own city. How nice that it had already been built for him. All he needed to do, was to take Dead Man's Hand. His newest lackey worked covertly for one of the rich ranches and would lure even more bandits into his camp. The law would't be able to stop him anymore. But Dead Man's Hand had to wait until tomorrow. Today, he would first tear McMiller's brood apart because they tried to cheat him, and this proof of strength should solidify his reputation. No one would dare to oppose him anymore.